During a very active, interesting life, author. Clive Cussler became interested in writing. He was in the Air Force during the Korean War followed by a career in advertising writing award winning commercials. In 1996 he wrote his first notification work, The Sea Hunters. From that work he was awarded a Doctor of Letters degree, with his work being accepted in lieu of a thesis. Then, in 2002 he was awarded the Naval Heritage Award for his efforts in the subject of marine exploration. He is also a Fellow in three prestigious marine organizations. In keeping with his marine interests, his books revolved around character, Dirk Pitt, who was a marine engineer, government agent, and adventurer. His first two novels were more traditional maritime thrillers, but the third, Raise the Titanic, established his iconic style.....a blend of high adventure and high technology involving villains, sunken treasure, and beautiful women. 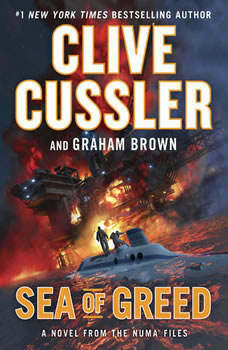 Cussler writes in the style like fellow authors, Michael Crichton, creating techno - thrillers that do not depend on any certain settings with great spectacular and outlandish plot devices. He has had more than seventeen titles on the New York Times fiction best seller list.